ATLANTA, May 16, 2017 /PRNewswire/ -- Georgia Power has announced plans to build a new 139 megawatt (MW) solar facility adjacent to Robins Air Force Base (AFB) in Warner Robins, Georgia, just south of Macon. The project was approved Tuesday by the Georgia Public Service Commission (PSC) and will be the sixth large-scale solar project to be developed by Georgia Power working with the United States military and the Georgia PSC. The Warner Robins facility will be the largest single solar project to date to be constructed by Georgia Power. The new solar facility will be located on approximately 870 acres of land reserved to prevent encroachment near the base, and is expected to include more than 500,000 solar panels. As with the company's other military projects, power from the facility will be delivered to the state's electric grid at or below the company's avoided cost, the amount projected it would cost the company to generate comparable energy from other sources. The solar project at Robins AFB is estimated to represent a more than $200 million investment and will help to enable the base to meet critical energy security and energy resiliency goals. "Today's exciting announcement is the result of extensive collaboration between Georgia Power, the Georgia PSC and the U.S. Air Force, as well as the foresight of local leaders and our neighbors in central Georgia," said Norrie McKenzie, Georgia Power's vice president of Renewable Development. 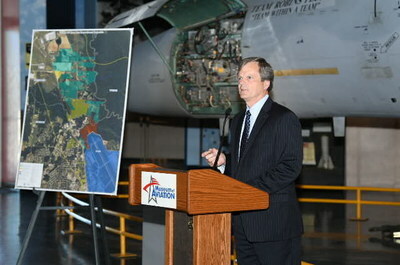 "At Robins Air Force Base, and across the state, we have found that we share a mission with our nation's military to secure local bases and contribute to our country's energy independence, while also adding cost-effective renewable generation as part of a diverse energy mix to provide our customers with reliable, affordable energy." Georgia Power expects to conduct planning, engineering and design for the project, as well as a competitive bid process to select a construction contractor, throughout 2017 and 2018. Construction of the facility is expected to begin no earlier than 2018 and the project is expected to enter commercial operation before the end of 2019. Georgia Power currently owns and operates 120 MW of large-scale solar facilities now online at Georgia military bases, including projects with the U. S. Army at Fort Benning, Fort Gordon and Fort Stewart and with the Department of the Navy at SUBASE Kings Bay. In addition, the company is currently building a 31 MW solar facility at Marine Corps Logistics Base Albany. Through its various solar programs, the company is adding millions of solar panels to Georgia's energy landscape while also ensuring reliability for customers. With approval from the Georgia PSC through the company's 2016 Integrated Resource Plan, Georgia Power plans to add up to 1,600 MW of renewable energy through 2021, fueling the state's momentum as one of the fastest growing solar and renewable energy markets in the nation. To learn more about Georgia Power solar programs, including resources and services available for business and residential customers, visit www.GeorgiaPower.com/Solar. Certain information contained in this release is forward-looking information based on current expectations and plans that involve risks and uncertainties. Forward-looking information includes, among other things, statements concerning the timing of construction projects and expected future renewable capacity. Georgia Power cautions that there are certain factors that can cause actual results to differ materially from the forward-looking information that has been provided. The reader is cautioned not to put undue reliance on this forward-looking information, which is not a guarantee of future performance and is subject to a number of uncertainties and other factors, many of which are outside the control of Georgia Power; accordingly, there can be no assurance that such suggested results will be realized. The following factors, in addition to those discussed in Georgia Power's Annual Report on Form 10-K for the year ended December 31, 2016, and subsequent securities filings, could cause actual results to differ materially from management expectations as suggested by such forward-looking information: the ability to control costs and avoid cost overruns during the development and construction of generating facilities, to construct facilities in accordance with the requirements of permits and licenses, to satisfy any operational and environmental performance standards, and the requirements of tax credits and other incentives, and to integrate facilities into the Southern Company system upon completion of construction; and potential business strategies, including acquisitions or dispositions of assets or businesses, which cannot be assured to be completed or beneficial to Georgia Power. Georgia Power expressly disclaims any obligation to update any forward-looking information.